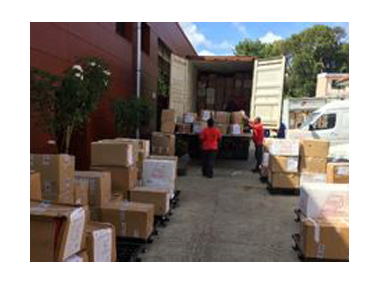 AGS Martinique has demonstrated its care and expertise through its lawww high-profile assignment: moving 450 m3 of archives stored in the University Library of the Schoelcher campus. AGS Movers Martinique has demonstrated its care and expertise through its lawww high-profile assignment: moving 450 m3 of archives stored in the University Library of the Schoelcher campus. All local media covered the culturally-significant event, as AGS operated swiftly to restore students’ access to the library. Caribbean University authorities were recently surprised to discover that hundreds of cubic meters of archives from the Martinique region and Monaco Oceanographic Institute had been stored in the Schoelcher campus’ University Library, since October 2011. When it was realised that the storage of the archive papers in the library’s basement posed a fire risk, the library was forced to close until the situation was rectified – an unpopular decision with students, as it fell just ahead of the exam period! The challenge for AGS Martinique: saving the documents and ensuring the rapid reopening of the University Library. With exams approaching, the library closure was particularly detrimental to students. It was therefore necessary to proceed urgently with the transfer of these archives. 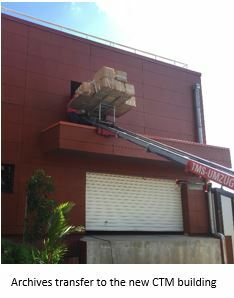 A new building dedicated to the national archive from Martinique had been constructed, but before any documents could be stored in it, the facility first had to be approved by the technical controller and be issued with a certificate of compliance. Fortunately, the Territorial Authority of Martinique (CTM) could count on the professionalism and expertise of the AGS Group with the removal of the files, as these sensitive timelines were factored into the operation’s planning. While waiting for authorization to start the transfer, AGS Martinique used the time constructively by orchestrating every detail of the operation in advance. “This was a last minute order that had to be implemented and managed.” explained Daniel Dulymbois, AGS’ team manager for the operation. AGS Martinique wasn’t deterred, however: it is experienced with handling projects of this nature. To complete the transfer and not affect students any longer than necessary, a reinforced AGS team of ten movers arrived with trucks and furniture lifts on March 17 at 08:30 with a clear plan of action! Archives transfer to the new CTM buildingFurther underlining the importance of this move, AGS Martinique’s team began the transfer of the archives under the spotlight of the local media. Bailiffs, representatives of the CTM and the University gathered to monitor their careful handling of the 450m3 of documents. “With the handling of archives, there is no improvisation!” added Daniel. The team successfully carried out the delivery in six days, transporting the archives to the new CTM building. Here all documents were classified and indexed, before being made available for consultation again. Making this operation particularly rewarding, the archives of the Institute of Oceanography in Monaco were found to include documents of great cultural value! These reports are the results of scientific surveys carried out by the Albert I Foundation. Following the transfer of the archives, the Schoelcher University Library re-opened on March 30, to the relief of its students. 150 m3 for the Association for Adult Vocational Training (AFPA).